Hello-Hello, is everyone having a good August? I have been buried with some non-blog-related things and am finally digging out, argh!! Today we have poll results and a few other quick updates for you. We begin with the August royal recess, when the majority of British Royal Family members enjoy some vacation time. As many are aware, the Queen spends much of the summer at Balmoral, her Scottish estate. The Queen is usually in residence for August and September. Historically Kate and William have visited in September, bringing Prince George and Princess Charlotte with them. 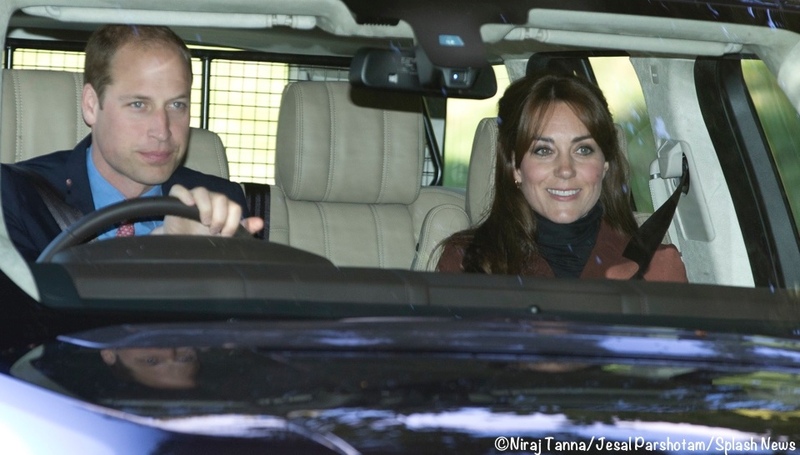 Below, the Duke and Duchess in September 2015 on their way to Sunday services at Crathie Kirk. With both children now in school, I’m not sure what the Cambridges might do regarding a Balmoral visit this year. Classes for both George and Charlotte begin the week of September 6th, well ahead of the week when the family usually traveled to Scotland. 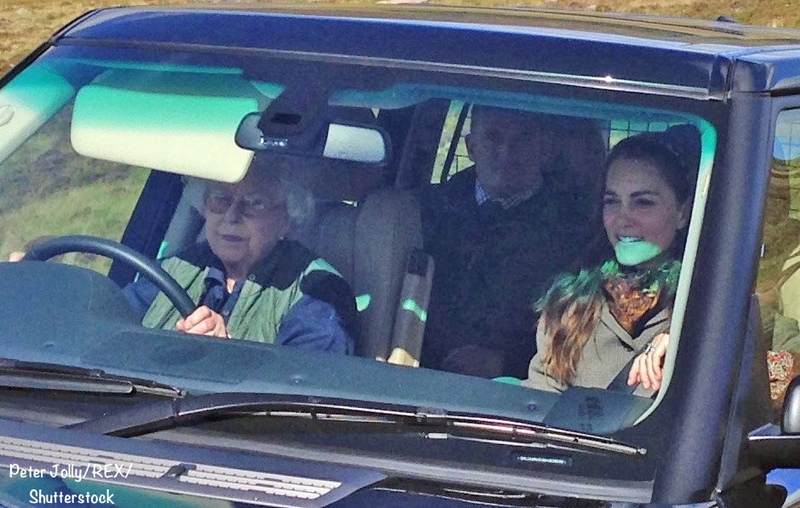 Below, Kate out for a drive with HM in September 2016. It’s possible the Cambridges might visit earlier than they have in previous years. 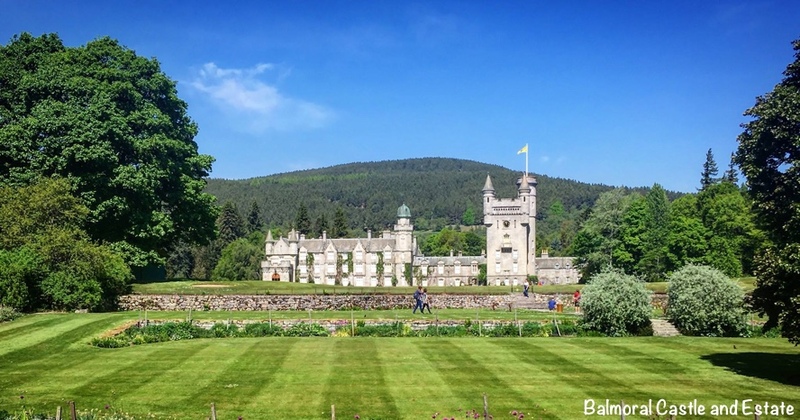 For more information about Balmoral, Hello! has a profile piece here; The Guardian has an article about the estate here; a People story is here. Also today, an update on the LK Bennett situation. You may remember that the retailer was not accepting orders via its websites for some time. 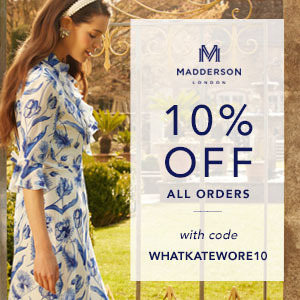 You can now order from the UK site, but that is not the case in the US. The same message remains on the US site saying the company isn’t taking orders online. 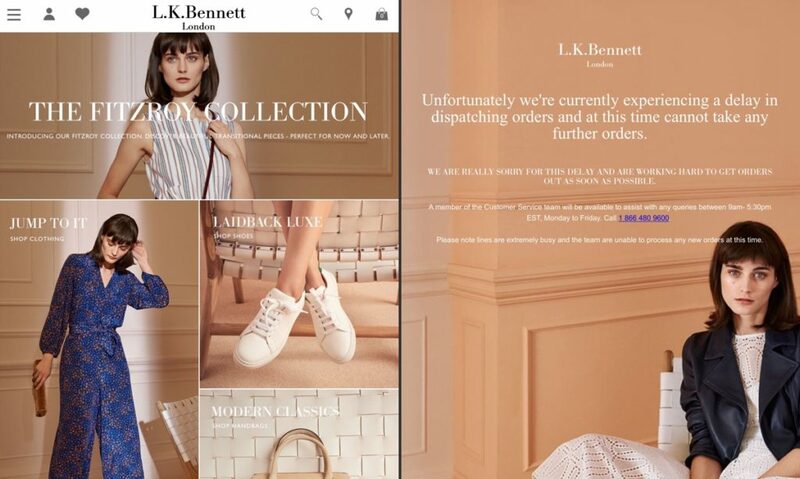 I have not received any response to my emails to LK Benett. In calling some of the US stores, I was told they do not know a date when shoppers will be able to order from the US site. They recommend looking for items on the UK site and then contacting a US store to see if the item is in stock. If I learn anything new about the situation, I will post the information here. 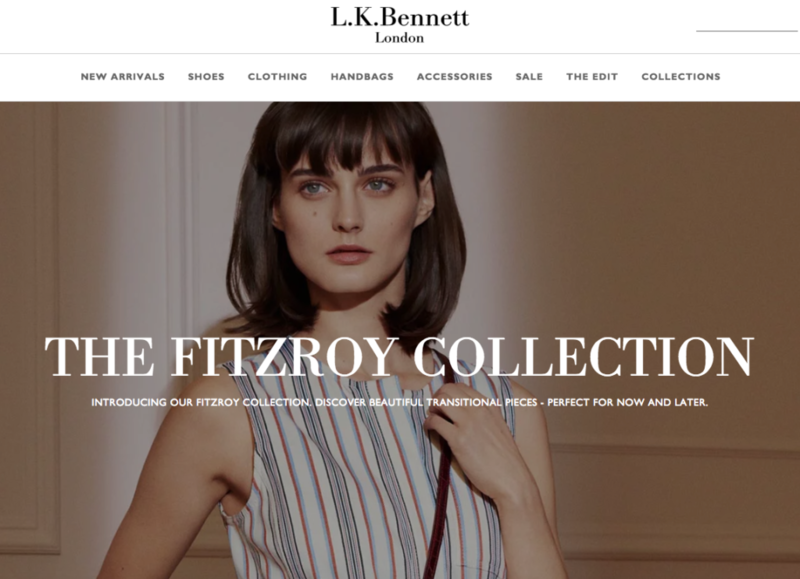 UPDATE Monday, August 20: LK Bennett tell me they were doing final checks today on the site and hope to have it back live mid-week. UPDATE Tuesday, August 21: The website is back up and running. 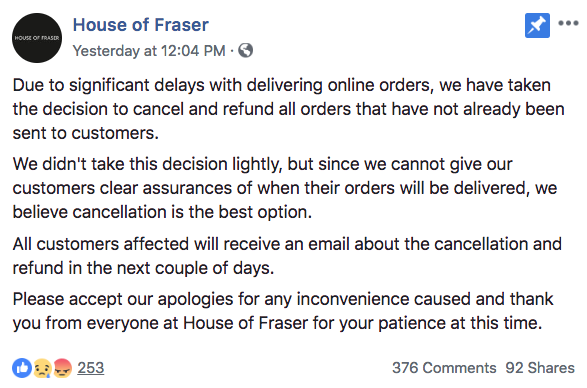 ADDED FRIDAY, AUG 17: On a quasi-related note, House of Fraser has canceled all online orders. This is from the retailer’s Facebook page: House of Fraser carries many brands worn by Kate, including LK Bennett, Hobbs, and Max Mara. The company went into administration (filed bankruptcy in US parlance) last Friday and was then purchased. 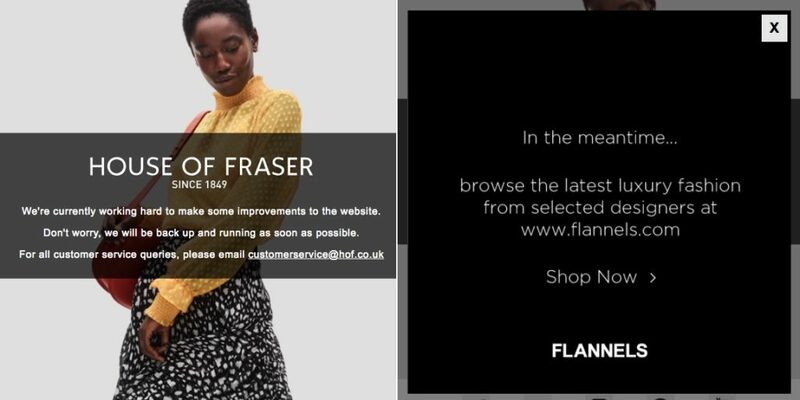 House of Fraser’s website remained offline on Friday, a day after the company cancelled all its online orders following delays triggered by a payment dispute with its warehouse operator. The 169-year-old department store chain was bought by Mike Ashley’s Sports Direct for £90m less than two hours after it entered administration. This is what you see on the company’s homepage. If you stay on the page long enough the graphic below left changes to the one shown below right, with the suggestion that shoppers go to Flannels, another of Mr. Ashley’s companies. Flannels stocks brands like McQ by Alexander McQueen, a selection of Mulberry accessories (but no apparel, shoes or other product groups), a limited range of Ted Baker London. I know quite a few readers have shopped at HofF over the years. Hopefully, the company will be able to stay in business. A few months back we had a comment from Christine; she suggested covering some FAQs during this quiet time. Today we’ll just do one, but I plan to answer some of the others in a post next week. Today’s question: What are the rules about wearing a tiara? (Of course, I picked this first!) 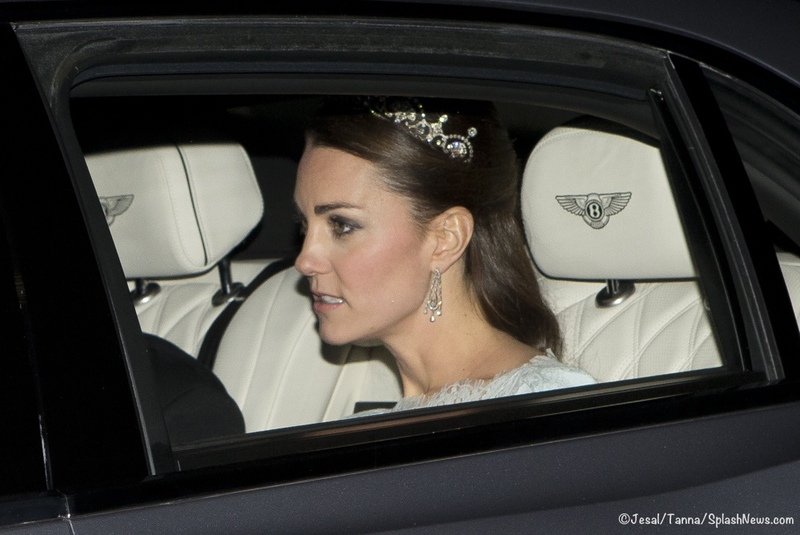 Below, Kate wearing the Lover’s Knot tiara on her way to the 2015 diplomatic reception. I’m limiting our tiara chatter to British royal family traditions, primarily because I am not terribly familiar with the practices and etiquette of other royal families and most assuredly would get things wrong. There are two specific occasions when we know we will see tiaras; both are white tie events, a step above black-tie. 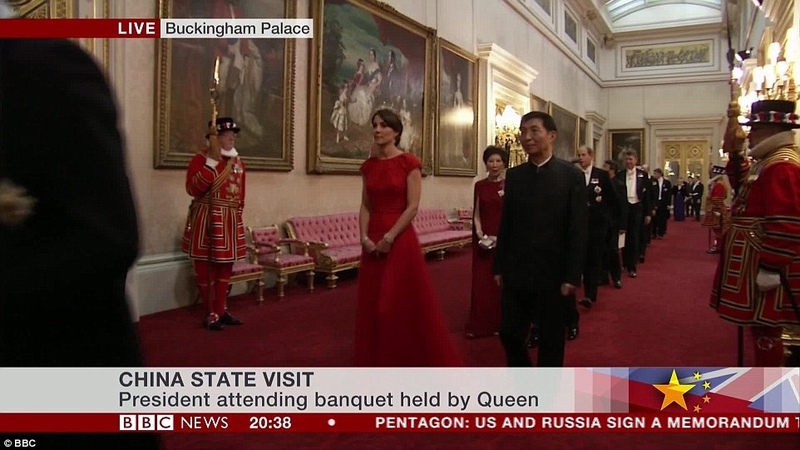 One is an official state banquet. 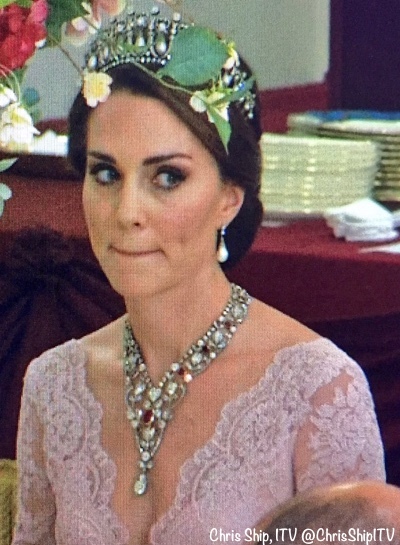 Below, Kate at the China state dinner in October 2015 wearing the lotus flower tiara. The other occasion is the Queen’s annual diplomatic reception. 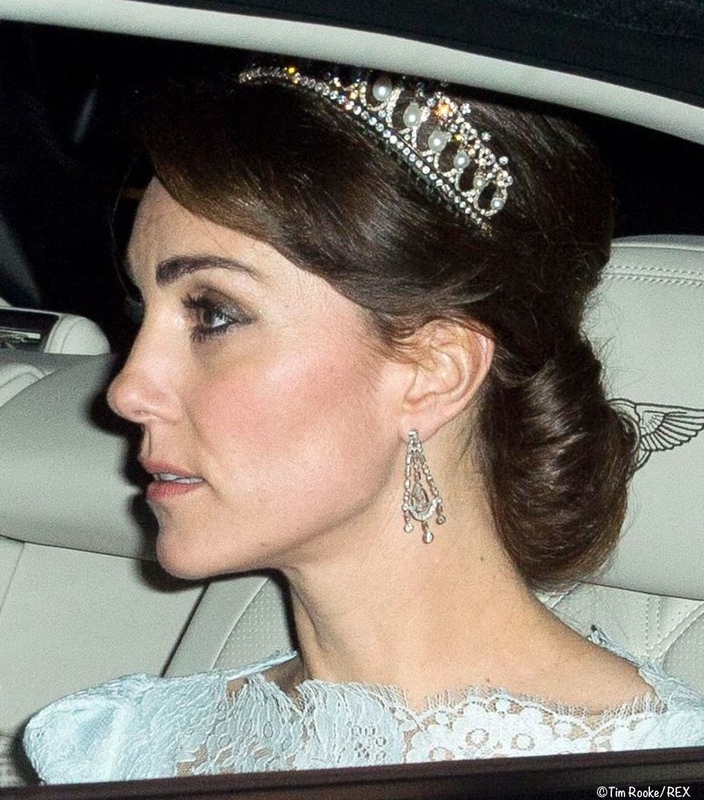 Kate was in pale blue Alexander McQueen and the Lover’s Knot Tiara at the 2015 reception. As far as who “can” or “should” wear a tiara, there was long a “rule,” that only married women should wear them. As noted by the Royal Order of Splendor, that is not the case anymore. And though people still tend to repeat it, I personally don’t put much stock in the marriage rule these days. Obviously it doesn’t apply to unmarried royal princesses, as they wear tiaras all the time and have for a long time. A BBC story quotes Grant Harrald, who offers etiquette tips via his “Royal Butler” website. “The old rule is that hats are never worn indoors after 6pm, because that is when the ladies changed into evening dress, and tiaras and the family jewels would come out. Mr Harrold adds: “For married ladies it was a sign of status and would show you were taken and not looking for a husband. The ultimate determining factor is the host or hostess. It is really up to them to set the dress code; they (or their staff) would let guests know well in advance if tiaras will be worn. Below, Kate at the Spain state dinner in July 2017. Having a lot of hair would help, as this will enable both the tiara… to be secured. Although there is a popular misconception that tiaras are heavy. In fact, very few are. However, they are like a stone hat; a bit cumbersome and the veil doubly so. Below, the Duchess on her way to Buckingham Palace for the 2016 diplomatic reception. Tatler has a piece with 10 Rules for Wearing a Tiara, and it also includes basic information, like tips for affixing the tiara to one’s head. The Order of Splendor post has more information; the full Town & Country piece is here and the BBC story is here. Wedding Dash has a post on How to Pull Off a Tiara with Any Kind of Wedding Hair. Now for our final item, the results of our poll asking for your favorite Wimbledon look worn by the Duchess. With a total of 4726 votes, the Catherine Walker dress remained firmly at the top of the list. The dress was a bit of a departure for the Duchess, with the wildflower print on the skirt, but it was a pretty change of pace and one that was obviously popular. The Mirror has a piece covering possible designers for Princess Eugenie’s wedding gown. A story in PR Week features Hello! Magazine’s Emily Nash talking about what it’s like to be a royal correspondent and editor, and working with the Palace public relations team. Harper’s Bazaar has a photo gallery looking at the 51 best costumes from The Crown. Tags : Duchess Cambridge style blog, Duchess Cambridge tiara, Duchess Kate fashion photos, Duke Duchess Cambridge diplomatic reception, Kate Middleton evening gowns, Kate Middleton fashion, Kate Middleton fashion blog, Kate Middleton state dinners, Kate Middleton Style blog, Kate Middleton tiara pictures, Kate Middleton wardrobe, tiara rules, what Duchess Kate wore, What Kate Wore, when are tiaras worn? This evening the Duke and Duchess of Cambridge attended the Queen’s annual diplomatic reception. The event was a white tie affair at Buckingham Palace, bringing our first photos of Kate in a tiara since her wedding day. 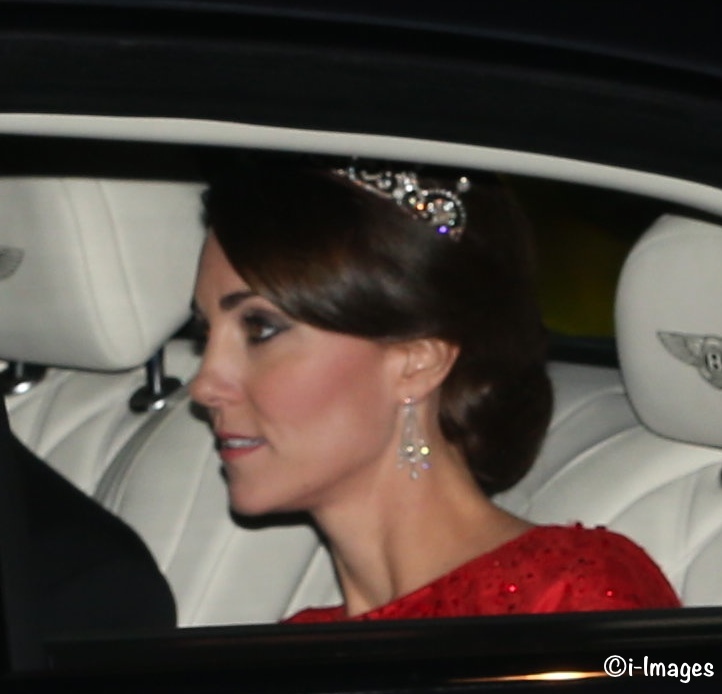 Kate is wearing the Lotus Flower tiara, also referred to as the Papyrus Tiara; it originally belonged to the Queen Mother. The Royal Order of Sartorial Splendor explains it was actually made from a necklace. It was made from one of her wedding gifts, a necklace of a Greek key pattern with pendant diamonds and pearls given by her husband, the future George VI. 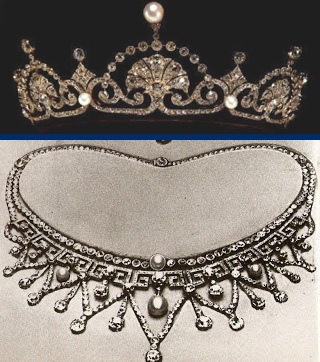 A Tiara a Day notes that the original necklace was create by Garrard Jewelers. In the 1920s (when she was known as the Duchess of York) the Queen Mum decided she preferred the diamonds and pearls be worn atop her head as opposed to around her neck. 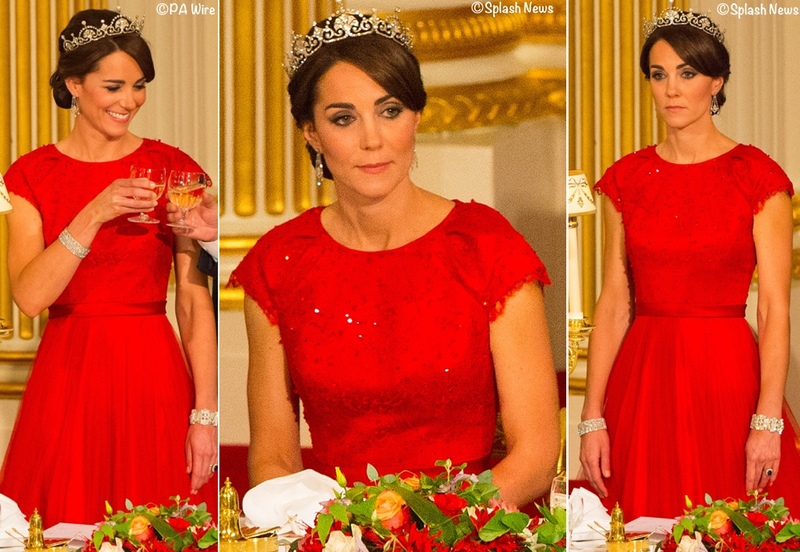 Garrad was given the task of disassembling the necklace and then recreating it into the tiara seen on the Queen Mum and then on Princess Margaret, and now, on Kate. (It has also been worn by others. Princess Margaret’s daughter-in-law, Viscountess Linley, née‎ Serena Stanhope, wore it on her wedding day.) This stunning image comes from the book Tiaras: A History of Splendour, by Geoffrey C. Munn, via the Royal Post. It is one of the more delicate tiaras in the royal vault. 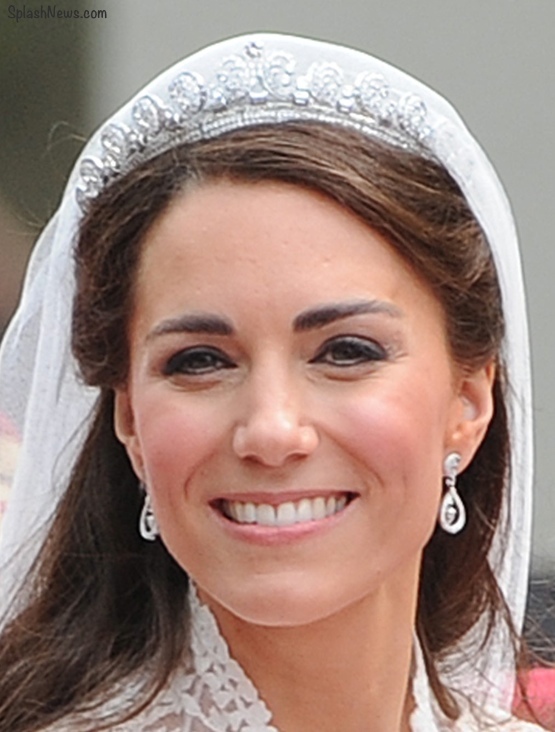 In some respects it looks lighter (not in weight, but in design and appearance) than the Cartier Halo tiara worn by Kate on her wedding day in 2011. HM loaned the Halo Scroll to Kate for the wedding. Had Kate any desire to wear it again this evening that would not have been possible. 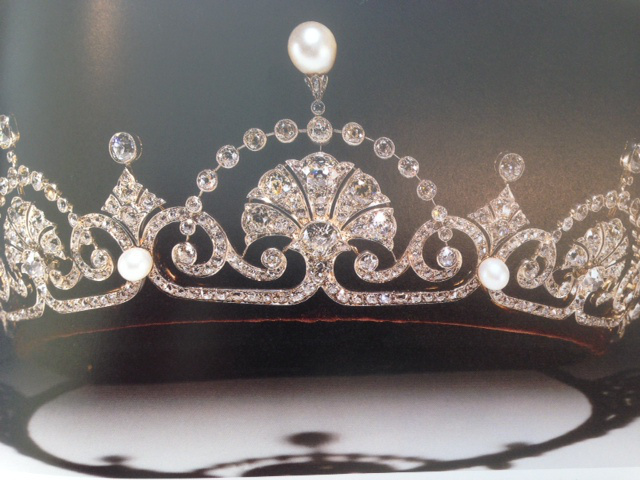 The tiara is part of the Cartier: Style and History exhibit at the Grand Palais opening tomorrow. (Many thanks to Joyce (auntym210 on Twitter) for letting us know the tiara is included in that exhibit. 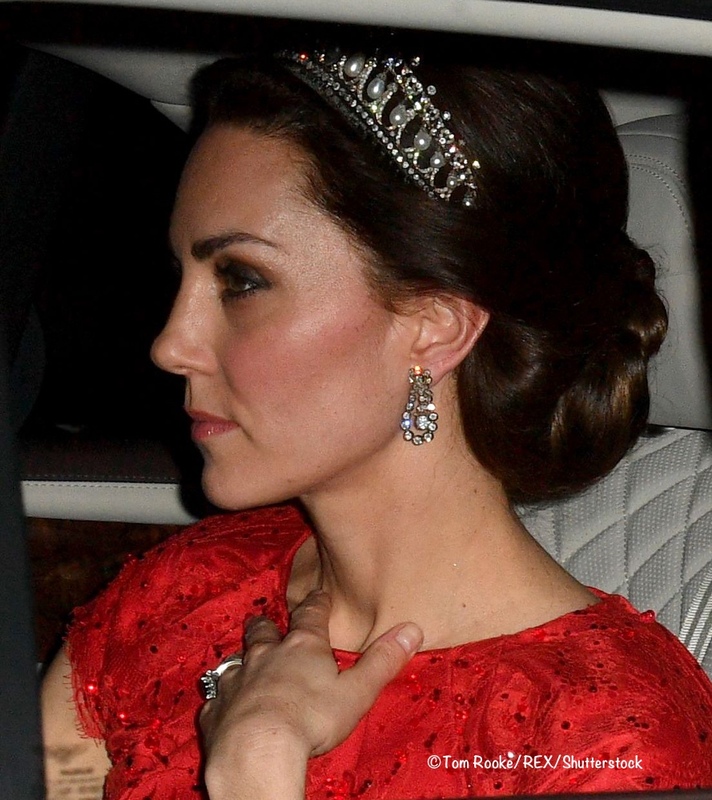 Kate also wore the diamond chandelier earrings loaned to her by the Queen. 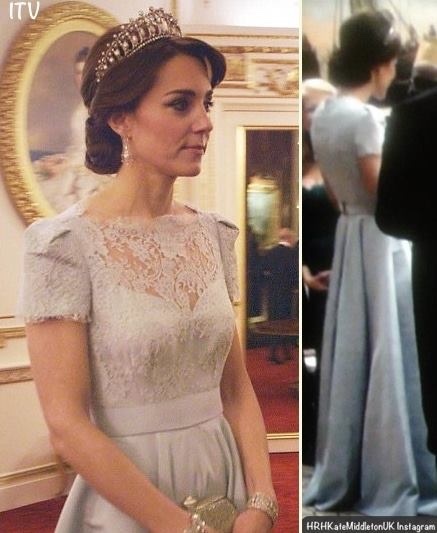 We have seen the Duchess wear them previously, she is shown below wearing them at the BAFTA dinner in Hollywood during the 2011 North American Tour, and then again this evening. 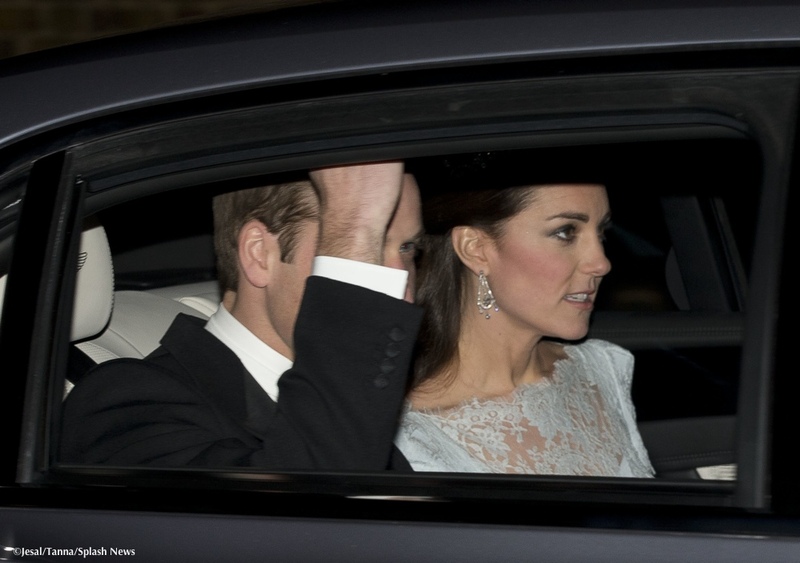 Royal Photographer Mark Stewart verified the Duchess was in a gown by Alexander McQueen. It is another piece using lace, it also features eyelash lace, similar to the McQueen dress worn for the Jubilee church service in 2012. We compare lace at the necklines below. The color of the dress reminds me of that icy blue of the Emilia Wickstead worn to the National Portrait Gallery this April. Kate’s hair was styled in a partial updo for tonight’s engagement. It is unlikely we will see any photos from inside the event, we didn’t even expect to see photos of Kate and William arriving. 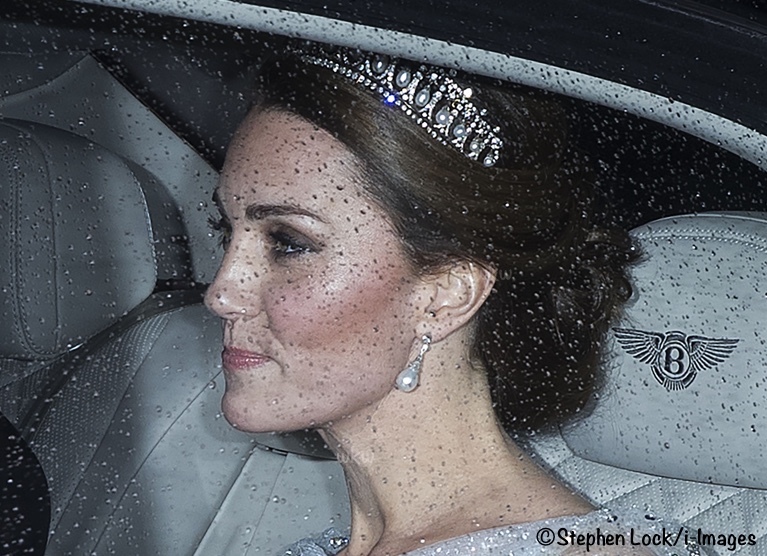 Tonight’s Tip of the Tiara (no pun intended, but appropriate nonetheless) to Mark Stewart (the same mentioned above) and Jesal Parshotam of Ikon Photos for bringing us photos of Kate and William arriving at Buckingham Palace event. A quick update to Kate’s Calendar: This Friday (the 6th) Kate will have tea with children and family members at the Shooting Star Children’s Hospice. She will also watch a music therapy session and meet volunteers. In addition to Kate’s own interest in the children’s hospice movement, this would fall under the umbrella of her EACH Patronage. Also this evening, we want to announce the lucky winners of our wonderful giveaway sponsored by the always-generous Links of London. Briana Reyes won the White Topaz earrings from the jeweler’s Hope Collection. 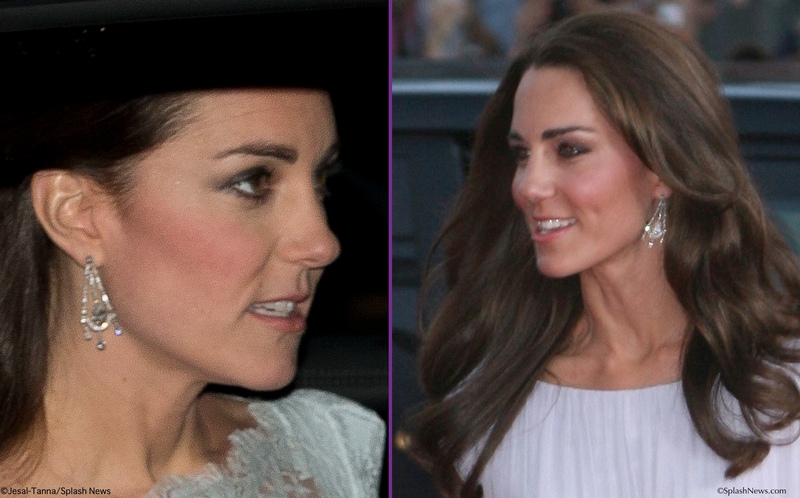 Alice Cruse will receive a pair of Kate’s Effervescence Bubble Stiletto earrings. Thursday evening William and Kate attend the premiere of Mandela: Long Walk to Freedom, a benefit for the Cinema and Television Benevolent Fund. The event takes place at the Odeon Leicester Square.